The regulatory measures government uses to protect endangered fish are not working. 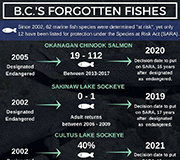 By refusing to protect endangered marine species in BC under Species at Risk Act (SARA), the federal government is seriously increasing the risk of extinction of species, such as Pacific salmon and steelhead trout. 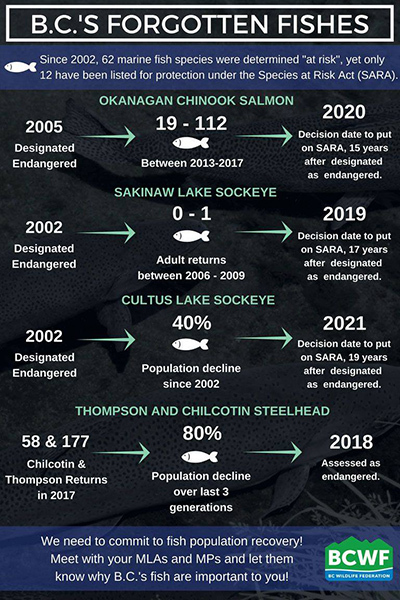 In March, the ELC wrote an op-ed to draw attention to the Chilcotin-Thompson steelhead trout and the problematic federal policy of refusing to list endangered marine species in BC under SARA, against the advice of their own government-authorized scientists. We followed this up in April with a request on behalf of BC Wildlife Federation (BCWF) to the federal Commissioner of the Environment and Sustainable Development and the Auditor General to examine Canada’s failure to protect endangered Pacific salmon and trout species under the Species at Risk Act. The 57-page submission details government’s refusal to protect and restore at-risk West Coast marine fish species.